We slept in Memphis, got up, had a delicious and painfully large breakfast at Brother Juniper’s, and hit the road for New Orleans. 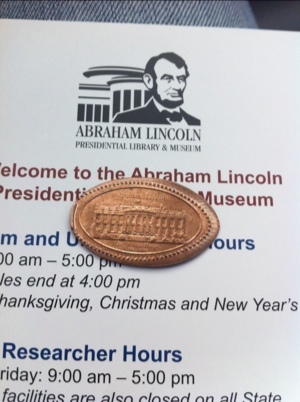 We commemorated our trip to the Lincoln Library by crushing his likeness. It was a pretty busy day. 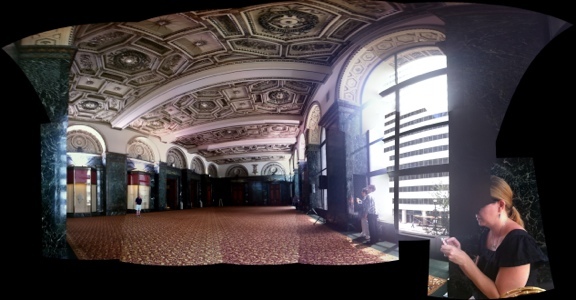 We checked out of the Tremont, dropped out bags in the car, and walked down to the Chicago Cultural Center, where we saw “Morbid Curiosity: The Richard Harris Collection.” Beautiful old building and an interesting collection of death related art. We then walked back to the car and started the trip to O’Hare to pick up Molly. I had mapped it in the morning to get an idea of how far it was, but hadn’t considered that Google Maps take traffic into account, so my 23 minute drive became a 45 minute slog. We picked up Molly and took surface streets back, down Cumberland to Roosevelt and Roosevelt to Michigan, through some cute and some rough neighborhoods. We got settled in the condo and everyone went to Flo & Santos, where E and I had a delicious kielbasa, sauerkraut and bacon pizza. We hit Trader Joe’s and Jewel Osco for supplies and went back to the condo for the evening. 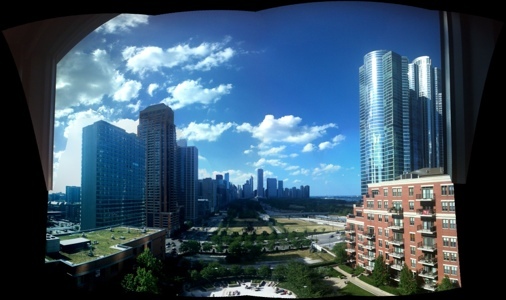 Condo views, day and night. View out the window of the Tremont. Not a great picture, but we’re here. We checked in to the Tremont Hotel downtown, dropped off out stuff, and walked down N. Michigan to Millennium Park and back. The Arch is enormous. I never really understood the scale of the thing until I got there. And then you ride up to the top in a tiny capsule, sitting way closer to strangers than you ever normally get, but everyone is excited and a little nervous so no one cares. And then you look down. And out at the city. I was impressed. And a little glad to get back down to the ground. Crystal Bridges was so impressive that after the first 15 minutes I forgot who built it. These hotel room views in Arkansas are not very impressive. Got in last night at 8:00, checked in to the Aloft Bentonville, had dinner and several stouts at the Mellow Mushroom across the street and went right to bed. Slept in a bit this morning (9:00am), and we’re just getting out of here at 11:00. Off to Crystal Bridges, and whatever else Bentonville has to offer.